What are the M&E Technology Tools of 2015? With the rapidly growing field of monitoring and evaluation, there are many technology tools that are designed to help the many roles of M&E practitioners. The fastest growing area has been digital data collection, which currently uses mobile phones and portable GPS systems. Reporting has become easier with all the tools for data visualizations and data cleaning. There are also many research options with statistical software and programming languages for data entry, documentation, and analysis. In addition, real-time M&E tools let you do program and data management with real-time project updates. What we found in the course was that there are tech tools that integrate multiple aspects of M&E. Here are several of the tools we discussed in the inaugural round of our Technology for M&E online class last fall, as crowdsourced by over 100 IT experts and M&E practitioners based in over 30 countries. In the next iteration of this course, we’ll be covering some of the latest tools including satellite imaging, remote sensors, and more. 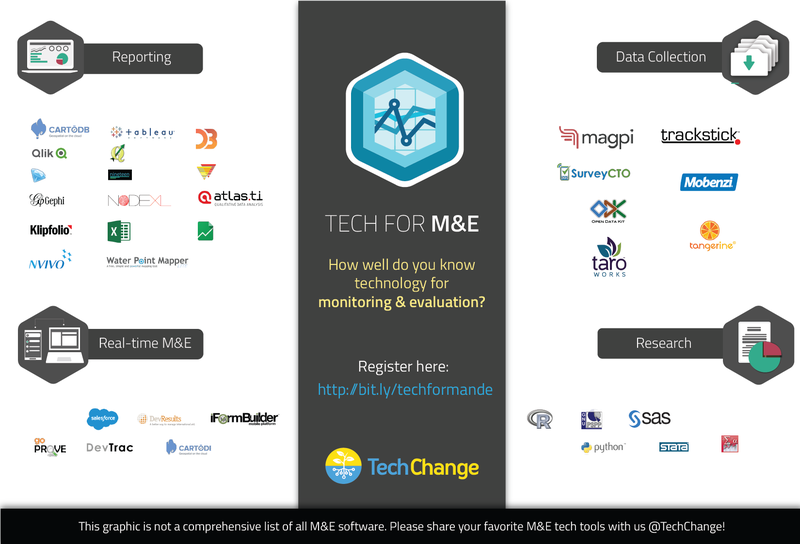 What M&E technology tools do you use? How has your experience been with these tools listed? Are there great tech tools for M&E that we missed? Please share with us in the comments or tweet us @TechChange. Interested in learning about these tools more in depth? Join us for our popular Tech for M&E online course that runs 14 September – 9 October. This is Awesome Wonderful Technology. Great Thanks for sharing..
Great to see this ! You might also be interested to have a look at http://www.e-smile.org, a “very new” player integrating multiple aspects of M&E and information management. Poimapper has supported multiple M&E programs around the world.